Almost everyone loves posting on social media. Be it pictures of good food, educational or business videos. Now, what if I told you that you will be getting paid for doing just that? Yes, that’s correct. FlipNPik is revolutionizing digital marketing by letting users monetize their social media posts. With FlipNpik, a blockchain-based collaborative social media exclusively developed for local businesses, users get paid every time they help promote a startup or business. The FlipNpik app is a proven technology and FlipNpik conducts its operations in Switzerland, Ireland, England, Canada, France, and Singapore. If they continue to expand worldwide, it would definitely be everyone’s preferred choice of social media posting since we can all monetize our posts! FlipNpik is the first collaborative social media for local businesses operating in a blockchain ecosystem. The value generated by the platform is distributed in an equitable and decentralized manner among all active collaborators. FlipNpik’s primary mission is to contribute to the improvement of the local economy and to promote the circuits of local and responsible consumption. The FlipNpik platform offers businesses enhanced visibility generated by the participation of their community. The participatory model gives user-collaborators the opportunity to get rewards or remunerations for their actions. On FlipNpik, every user gets the chance to be an influencer and get paid for it! User-collaborators contribute to the creation of value by improving the visibility of companies through different actions such as adding new businesses to the application or becoming an Ambassador Partner. The Flip Social (FS) is a reward system dedicated to stimulating and retaining platform users. In return for their positive actions, user-collaborators receive Flip Social which they can use to benefit from instant promotions or simply to entertain themselves with the games available on the platform. The Flip Social obtained by users may be, for a limited period, converted into FlipNpik tokens. 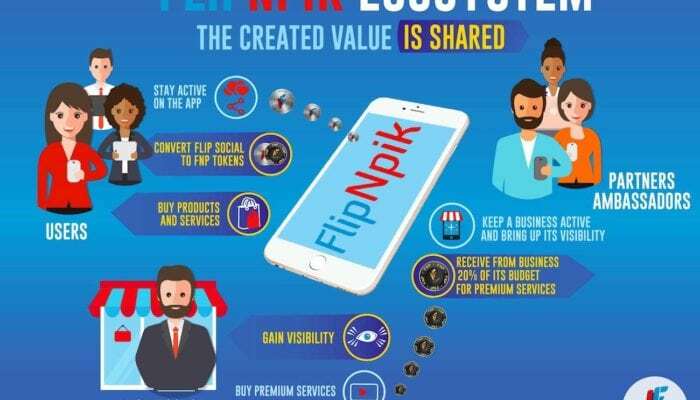 The FipNpik token (FNP) is a utility token, distributed and identified on the Stellar Platform and is the cornerstone of the economic model of the FlipNpik Ecosystem. As the premium token of the ecosystem, it can be used for the same actions as the FS and much more such as having access to premium offers and services and buying goods and services. Users with FNP will have the opportunity to become an Ambassador Partner of a business on the FlipNpik Platform. Ambassador Partners receive a bonus from their business when they actively contribute to increasing the visibility of that business within the Ecosystem. Just as the FlipNpik ecosystem promotes community and a fair and equitable way of sharing the wealth, the FlipNpik ICO is no different. Giving ‘whale’ bonuses to just about anyone who can fork out USD 100 to buy into the ICO is as democratic as it gets. To earn bonuses of 50% (up to 100% if you refer a friend) or start becoming a FlipNpik influencer, please visit their website now as this offer will end in a few days.